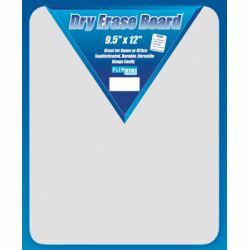 Catalog Home > Dry Erase Boards, 9 1/2" x 12"
Economical, unframed lap board with a plain dry erase surface is ideal for doodling, math or handwriting practice, and more! Quality write-and-wipe surface is non-ghosting. Hardboard backing is warp and chip resistant. Radius corners for comfort and safety. Adhesive squares included for mounting. Measures 9.5" x 12" x 0.125".